While traveling, we expect the unexpected, adventure. While traveling we try not to expect generosity, though we often experience it. It is rare, though, that generosity is the adventure. One adventure we planned to have in Gyeongju was to sip some homemade makgeoli and eat what was rumored to be the best pajeon in Korea. In a brilliant stroke of cross-cultural journalism, a friend from the U.S. described makgeoli as fizzy, alcoholic horchata. An important point for sticklers of journalistic detail is that makgeoli is brewed from rice with a complex starter of bacteria, fungi, and yeast, while Mexican horchata contains no alcohol and regularly stars cinnamon and sometimes vanilla. 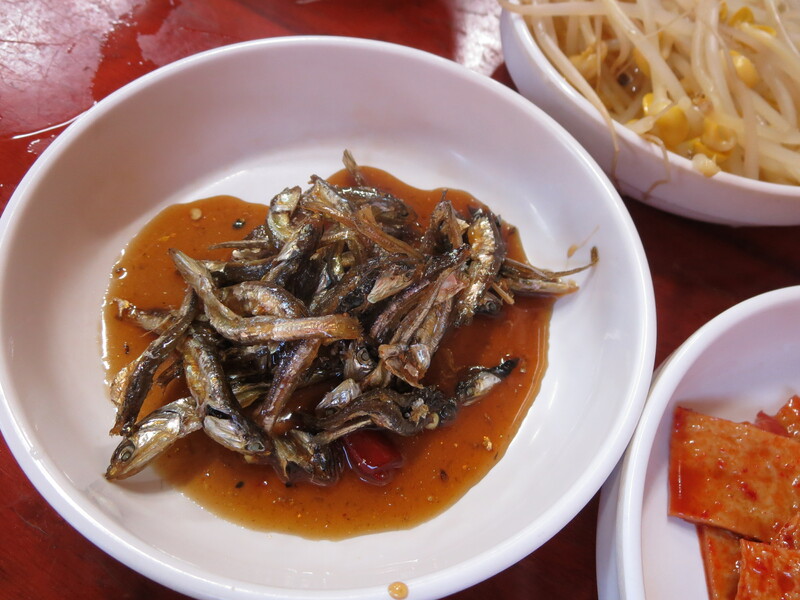 A bowl of tiny, dried, whole fish in a sweetened soy sauce. Side dishes like this are common accompaniments at Korean restaurants. Generosity starts with dinner. Click the photo to enlarge. Based on a tip from follow travelers, we went looking for an establishment called Hyundai Makgeoli (More precisely, that’s 한대 막걸리 (And I apologize if your browser doesn’t display Hangul characters correctly.).). Tourist maps and Internet maps weren’t helpful in locating the joint. Undaunted, we wandered around the noted neighborhood on foot. Surely a place with a reputation as stellar as this would be easy to find: busy, flashing lights, maybe even a few roman characters thrown in. Disappointed in our search and with stomachs beginning to rumble, we decided to seek advice in the local police station. We tried to clarify our needs in a two-way hash of English, Korean, smart-phone images, and drawings. Generously, he put aside important matters of Korean justice and precinct paperwork to take up the map on his smart phone. When that proved fruitless, he took up our conundrum with his fellow officers, and then returned his phone, taking a different tack. Finally he raised his hand in victory, laughing. “Hyeondai Makgeoli. Not Hyundai Makgeoli.” He gave viable directions. It was three blocks from the police station. Now we know, and so do you when you go to see Mr. Kim: it’s 현대 막걸리, not 한대 막걸리. We arrived at Hyeondai Makgeoli at dusk. The yellow glass panes of the storefront had no trace of Roman characters, the glass doors were thrown wide open, and only four of the twenty tables had customers. We could see big tea kettles, but nothing that looked like liquor to our eyes. A restaurant in Korea without an open beer or soju bottles looks weird, bereft. Could the cop have been mistaken? Was this really our fabled destination? We took a table near the exit, while the waitress eyed us nervously from the door into the kitchen. Finally she broached the gulf. Yes, carrying menus, but not with confidence. Our Korean is abysmal. She stared at us uncomprehendingly. The waitress had no English. Her face started to redden in embarrassment because she couldn’t connect with her customers. The menu was in Korean and had no pictures. Her blush deepened, but she was diplomatic. Gestures were attempted. The general concept of food and drink were broached easily enough, but it was clear that she wanted us to make more nuanced decisions about the details of the dinner. Her mission was to make our taste buds dance, and no guesswork on her part would substitute for the revelation of our desire. Both sides were near breakdown when she upped her game. Rather than let us go away hungry, she turned to the customers nearest to us and asked them for help. From a social perspective, I don’t think her maneuver was easy. It’s a public admission that she—who is honor-bound to satisfy customers—needs the help of a patron. 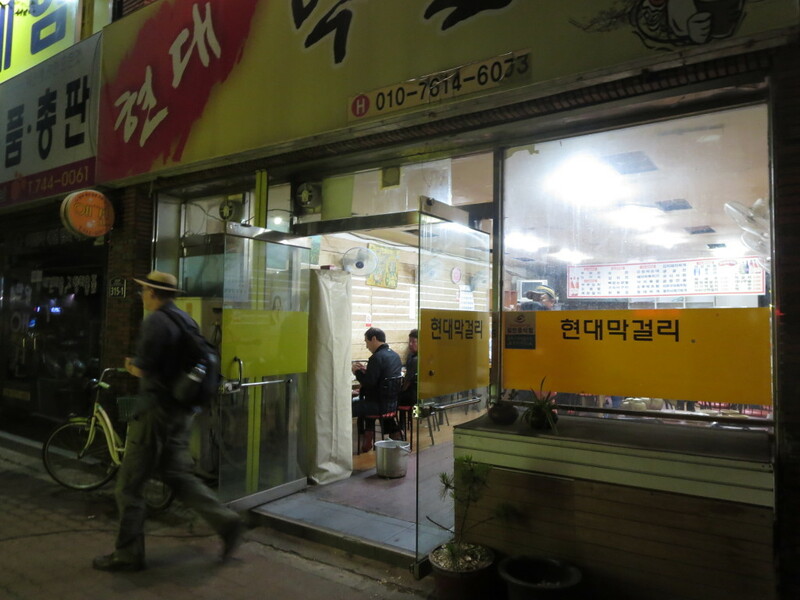 Yes, it is a neighborhood joint—and not a fancy one—but honor and face are important in Korea. In retrospect, her reaching out to the table next door was a significant social risk for her, and an act of generosity toward us. Prompted, Mr. Kim and his associate (Let’s call him Mr. Lee.) rose slowly from their chairs and weaved towards us. Their cheeks were bright red, their eyes glassy, and their smiles generous. It was obvious they knew the Korean to order alcohol: they were three sheets to the wind. 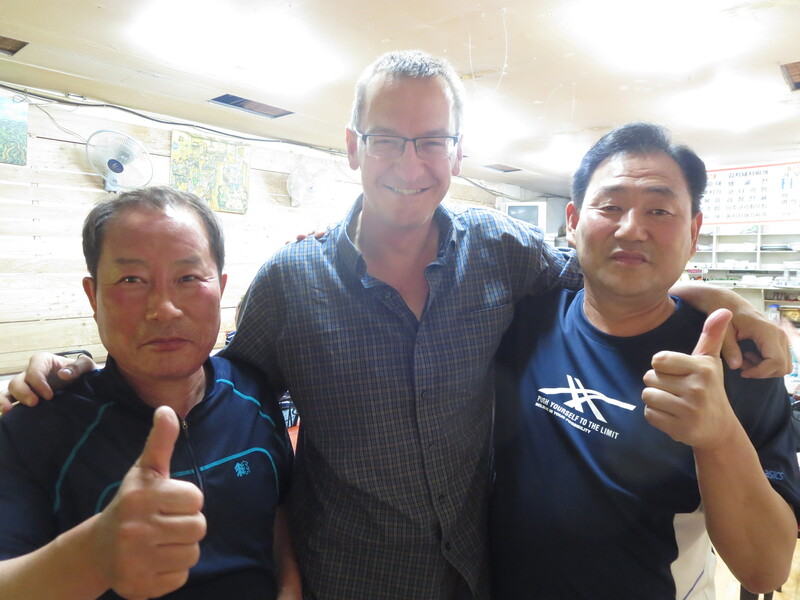 I visit the table of Mr. Kim and Mr. Lee to offer our thanks. Mr. Kim is facing the camera, our camera-shy waitress is in the red shirt near the counter. This photo offers a sense of the spartan nature of many Korean eating establishments. Click the photo to enlarge. While they were tottering our way, Mr. Lee remembered his English and I remembered that in our main guidebook I’d seen the Hangul for pajeon (파전). I dug into my bag and Mr. Lee his brain while the waitress explained to Mr. Lee the help she needed. For a few moments his face went a kind of calm, inscrutable blank that only Korean faces can. I could almost feel him gathering himself for action. Having abandoned our phrasebook for the main guidebook, I could point with greater confidence. My finger underlined 파전. Mr. Lee bent over to look, nearly toppling onto the table. There are times as a traveler where you are trying to say the right thing, no, you’re sure you’re saying the right thing, but it’s not connecting with the ears of the native listener. Pajeon. I’d tried that word with the waitress—or so I thought—but without success. Mr. Lee made the difference. She made marks on her notepad, then spoke quickly to Mr. Lee. Context is everything. With the question clear, the pointing of my finger could fire the right synapses. I pointed to the second word in the establishment’s name. The entire restaurant let out a sigh of relief and approval. 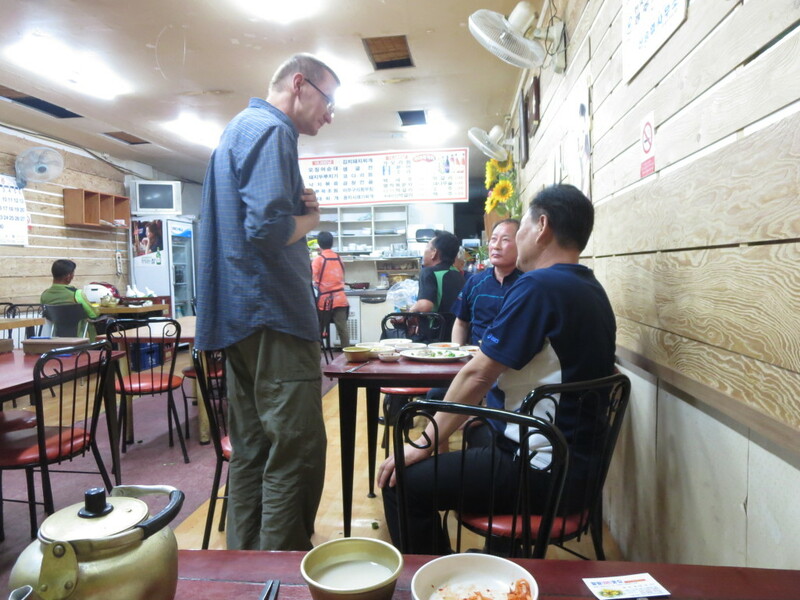 Not only had our needs been made clear, but we—inarticulate and strange—had ordered the specials, the very dishes which these Koreans felt made this establishment notable. Just behind Mr. Lee, Mr. Kim was beaming. The waitress made final marks on her pad and dashed off to the kitchen, her deepest blush a red hint in the air. With their translation duties complete, I expected Mr. Lee and Mr. Kim to weave their way back to their table. But no, they wanted to converse. Mr. Lee helped the intensely curious Mr. Kim. How long in Korea? Where were we from? What did we do? Great sounds of appreciation were voiced when our answer of “teachers” was translated. Mr. Lee’s wife was also a teacher. 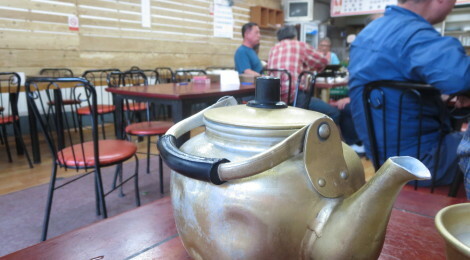 The waitress returned, carrying one of the immense teakettles and two smallish metal bowls. Only the kettle wasn’t full of tea: it was makgeoli. Mr. Kim, beaming all the broader, gestured for us to pour. We did, and we offered the kettle to them. “Thank you for your help.” Our gratefulness was genuine, and we probably didn’t need a whole kettle of booze. Might we pour some of our makgeoli into their bowls? They were clearly delighted by our attempt at generosity, but they steadfastly refused, gesturing the kettle back toward our still-full drinking bowls. The waitress was working like a shuttle diplomat, this time bringing small plates of side dishes for our dinner. The arrival of food was some kind of protocol. Mr. Kim and Mr. Lee to return to their makgeoli while we took first sips of ours. The supporting dishes are arrayed on our table. The milky white liquid in the golden bowls is makgeoli. The puffed rice in the lower right is a free bar snack that arrives with drinks. Counterclockwise from top in white bowls we have Kim chee, bean sprouts, dried fish and a spicy, dense tofu skin to round out the offerings. Click the photo to enlarge. Yes, the milky-looking beverage was sake-like in flavor, but the comparison is pallid. Cool, despite being served a kettle, the makgeoli was rich, almost silky in its texture. It had a sweeter, denser flavor than any sake I’ve ever tasted. The effervescence of this homemade brew was slight, the tiniest tickle on the tongue. We made hoots of delight, clinking our bowls. Then the waitress made a grand entrance. Upon our table she set a platter. On it rested a gigantic, beautiful pajeon, still steaming from the griddle. Eggs lovingly held together a tangle of green onions. Some of the onions were browned from the griddle, others wilted by the heat, and still others retained some of their fresh crispiness. Small bits of cuttlefish nestled in the mix. Salt and soy added to the flavor, and a garlicky, deep red, peppery hot concoction was provided for our saucy pleasure. Is kim chee the only thing more quintessentially Korean than pajeon? Or maybe makgeoli is more quintessentially Korean. 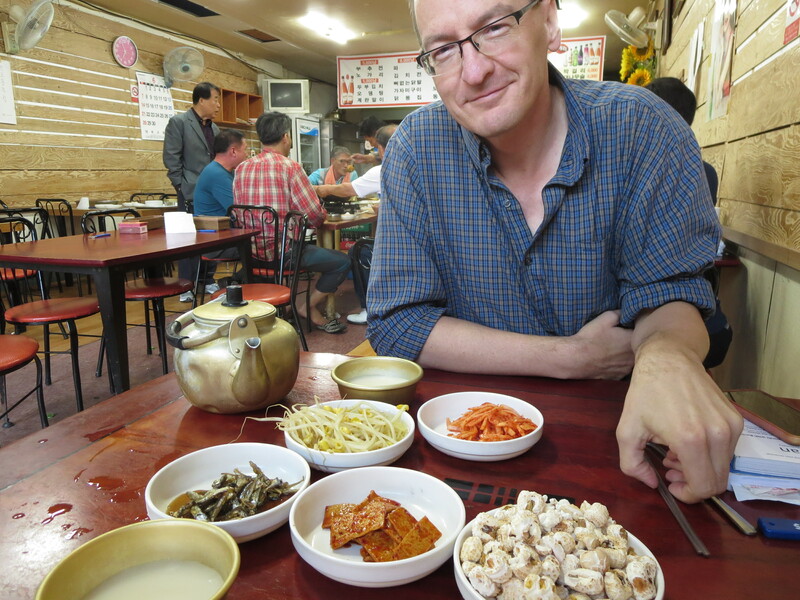 We were perhaps a third of the way through our pajeon when the waitress brought us a second kettle of makgeoli. It wasn’t something we’d ordered. Our first kettle was just half empty. The simple elegance of pajeon. The green is spring onion, and the darker, sometimes purple pieces are cuttlefish. This was the very tastiest we had in Korea. This dish will be on my list of things to learn when I once more have a kitchen. Click the photo to enlarge. Mr. Lee, promoted from translator to envoy, was back at our shoulder. “Gift from Mr. Kim.” Mr. Kim: beaming local, buyer of drinks. I gave him back a thumbs-up: “Korea number one! Gyeongju number one!” Smiles. Laughs. Handshakes. Thumbs-up. Bows. Thanks reiterated. Number one! Mr. Kim (left), Mr. Lee (right), and I celebrate international good will, good food, and good drink. Generous, friendly men, these two. If you see them in Gyeongju, give them our best. Click the photo to enlarge. It was the very last card of the small stack I’d brought on the trip. I extended it to Mr. Kim with both hands, text facing him, bowing. I was hoping that what I knew from exchanging cards with other Asians applied without embarrassment in Korea. Mr. Kim bowed, accepted my humble offering with both hands, and beamed. In a similar way he offered me one of his cards. The only items legible to me were the numbers. Part of the title used the number “88” in red bold lettering. I would later discover this was a sign of good luck. 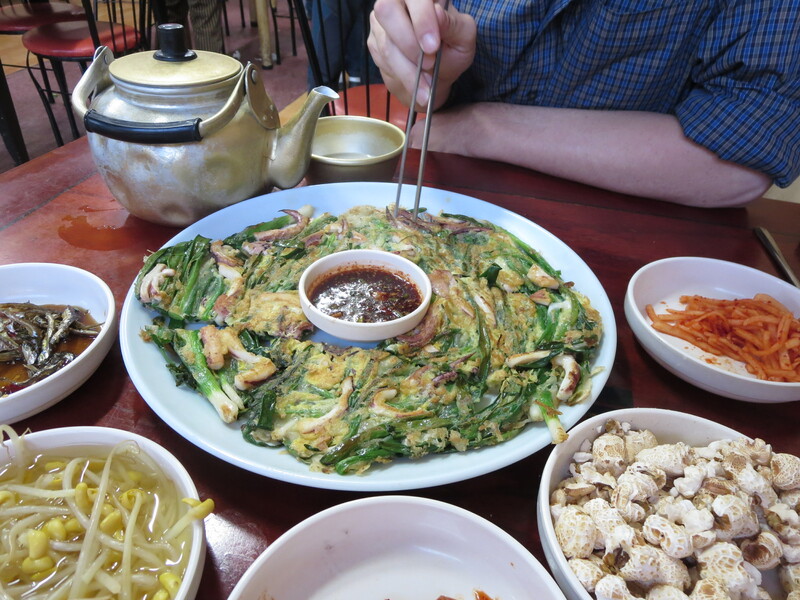 We were down to the last quarter of our pajeon when the waitress—I had begun think of her as an attaché in the Gyeongju-Makgeoli Embassy—brought a second main dish: something appearing more like an omelet than anything we’d so far had in Korea. Mr. Lee was again at our shoulder. “Gift from Mr. Kim.” Mr. Kim: exporter of flowers, gifter of eggs. Could my steps be any more humble? Our thanks more heartfelt? Mr. Kim’s generosity any more obvious? Oh. Karaoke. Or, to be appropriately Korean, noraebang. I am not a strong singer. Poor pitch. I am an especially weak singer in Korean. Can’t read. “Still eating,” I gestured back at the feast that Mr. Kim had graciously extended for us. At Alison. They were crestfallen that we wanted to consume the food and drink they’d ordered on our behalf, but with some shooing from the waitress, accepted our refusal to spend the remainder of the night signing songs we did not know. Alison and I were two sheets to the wind when Mr. Kim and Mr. Lee made their final goodbyes. Smiling. Shaking hands. Bowing. Giving everyone’s country a thumbs-up. Pictures. Everyone must eventually leave Heyondai Makgeoli. We tottered home under our own power, a feat that wasn’t obviously in our capacity after two kettles of Korea’s best drink. Click the photo to enlarge. We marveled at them as they tottered off into the night. He paid our bill. Not just for the extra makgeoli he’d ordered for us, or the egg dish. No, he paid for our entire dinner, secretly, before leaving, without a word to us. Every last won of it. The waitress, our attaché, wouldn’t even accept a tip. She’d learned two words of English since we’d entered. “Mister Kim,” she said smiling. One of the best stories yet, now could you and Allison go drink and eat with the rest of the world? Teach them love and kindness as you two obviously exude it. I have loved following you to places I may not see, but this story made me tear up, maybe there is hope for our children’s world!! On a lighter note, I have a kitchen and spare room come on over, we will gather your Mom the rest of the gang and you can most assuredly cook for us!! I’ll even tidy up for you. We have to bring Rich and Mac or there will be trouble in the ranks ya know?